Cowboys linebacker Anthony Hitchens collides with Lions tight end Brandon Pettigrew on a controversial reversal of a pass interference call. All the tumult and shouting from the Dallas Cowboys 24-20 win over the Detroit Lions in Sunday’s NFC Wildcard game at AT&T Stadium in Arlington, Tex. is not coming from Tony Romo’s game-winning eight-yard touchdown pass to Terrance Williams. Fans on social media and on sports talking radio have been debating the controversial pass interference call or better yet non-call that happened midway through the fourth quarter. Ahead 20-17, the Lions had a third and one at the Dallas 46 when quarterback Matthew Stafford threw a pass to tight end Brandon Pettigrew. A flag for pass interference was called against Cowboys linebacker Anthony Hitchens, who appeared to be face guarding Pettigrew while also making contact with his shoulder while the ball was in the air. Incredibly, referee Pete Morelli announced that the flag had been picked up without explanation. After the game, Morelli told pool reporter, ESPN’s Todd Archer that it was the head linesman who overruled the back judge who initially threw the flag. He also said that unlike the collegiate level, face guarding a receiver is not a penalty. To be honest, it was bad officiating on that play in more ways than one, but it wasn’t the reason the Lions lost the game. I’ll get to that momentarily. After that call, things began going South for the Lions. On fourth and one, the Lions intentionally took a delay of game penalty and then punted. But Sam Martin’s punt went just 10 yards. It took the Cowboys 11 plays and 59 yards to get what turned out to be the winning score. On social media, the non-interference call was justifiably vilified by fans, especially those who hate the Cowboys. Some even pointed to a story that came out back in August that said Dean Blandino, the NFL’s Vice President of Officiating, was seen on a Cowboys-themed party bus hosted by Jerry Jones. I guess they were implying that somehow Jones slipped Blandino a little something-something to instruct his guys to call things the Cowboys way during the season. Enough of the conspiracy theories, let’s get down to the football end of all this. For starters, the lack of an interference call was merely one thing the refs missed on the play involving Pettigrew and Hitchens. As he was running his pattern, Pettigrew grabbed Hitchens face mask—a 15-yard penalty against the offense. 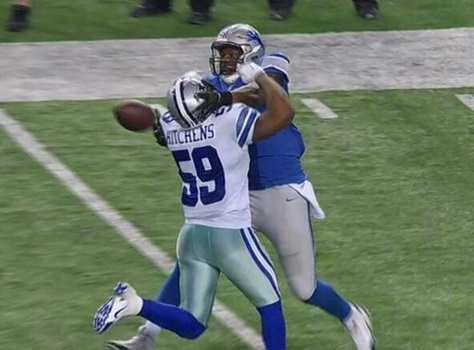 But then Hitchens grabbed Pettigrew’s jersey, which should have been defensive holding or illegal contact. And lest we forget the antics of Cowboys wide receiver Dez Bryant, who came off the bench without his helmet and should have gotten a 15-yard penalty. On that one play the officials definitely got it wrong. But at the end of the day, it wasn’t the reason the Lions were eliminated from the playoffs. The Lions have themselves to blame for losing this game. After the controversial play, the Lions still had fourth and one at the Cowboys 46. If they go for it there and make it, we’re not talking about what happened on the previous down. I’d like to think that if you have players like wide receiver Calvin Johnson or even Reggie Bush you can get one yard against an average Cowboys defense. Johnson, who caught five passes for 85 yards, constantly burned Cowboys cornerback Brandon Carr. Running back Joique Bell, who had 43 yards rushing, should be able to get one yard against that defense. But head coach Jim Caldwell played it conservative and punted, which was not a bad thing to do to pin the Cowboys deep into their own territory. Unfortunately, Martin shanked the punt and the ball traveled a mere 10 yards and put Dallas in good field position at the Cowboys 36—bad execution on the part of the Lions. If you go back to the play on third and one, the reason there was a collision between Pettigrew and Hitchens. It was a poorly thrown ball by Stafford. If he gets some loft on that ball and puts it out there where Pettigrew can get it, it’s a big play for the Lions. After Dallas scored the go-ahead touchdown, the Lions had the ball with 2:32 and two timeouts left. That’s plenty of time to march down the field and win the game. The Lions drove from their own 20 to the Dallas 42 and needed three yards to convert on fourth down. Unfortunately for the Lions, Stafford not only gets sacked, but he fumbled the football. You can’t put that on that non pass interference call. The Lions had an excellent opportunity to win the game, but did not execute when it counted. After scoring the game’s first two touchdowns in the first quarter, Detroit scored just six points over the next three quarters. The Lions rolled up 257 yards of offense in the first half and had 13 first downs. In the second half, Detroit had just 140 yards and just six first downs. I know the emotion of Lions fans and those who just hate the Cowboys are going to harp on the non-interference call with eight minutes left in the fourth quarter as the main cause of Detroit’s demise. Yes, the officials screwed up royally on that one play. However, the Lions did not make enough plays to advance to the next round, something Caldwell was quick to point out during his postgame press conference. “I’m not going to sit up here and act like that was the play that made the difference in the game. We still had our chances,” Caldwell said.